We were supposed to spend Saturday afternoon turning the soil in our garden plot and planting the cucumbers and beets I’m hoping to be overrun with at the end of the summer – possibly the hardest part about coping with this time of year is that nothing new has grown to the point of being edible yet, and I’ve eaten all my pickles from last year. It’s a dark time. But it rained, and we had no other plans. And in these dark times the best thing you can do for your mood and your health is to brown a large piece of meat in bacon fat and roast it low and so slow in a broth that just gets richer and tastier by the hour. 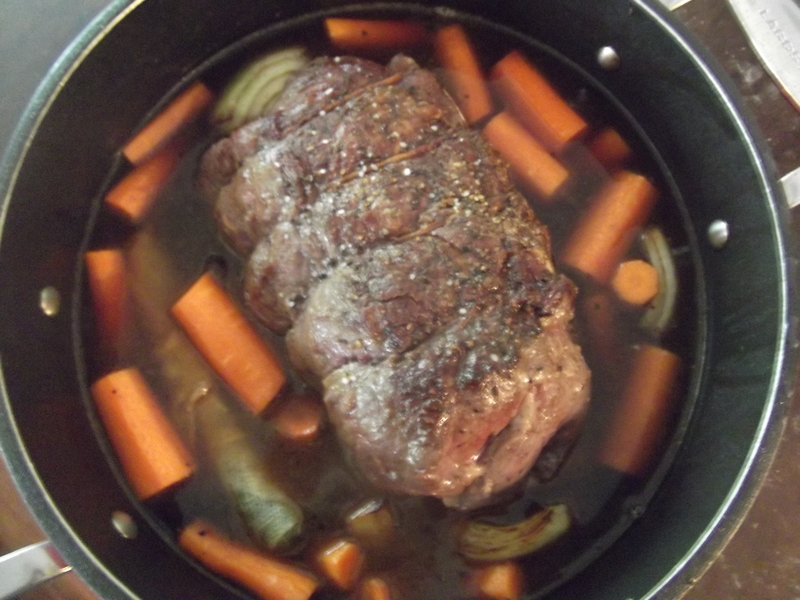 I spent the afternoon wearing an apron and cooking a pot roast. (I did burn my fingertips and swear like a wounded sailor though, so don’t worry – nothing’s really changed.) I don’t make many pot roasts, but we got quite a few chuck roasts with a half-cow we bought and the Googles don’t suggest much in the way of alternative uses for this particular roast. We’ve been making the most of it. And pot roast can be such an inedible thing. Why are they so often so dry? What cooking process could possibly render a cut of meat so grey? Even in restaurants, where pot roast finds its way onto menus under the guise of comfort food, I’ve had the kind of stringy meat that turns to cotton wads in your throat, the kind where you are asking a lot of your esophagus just to get it down. 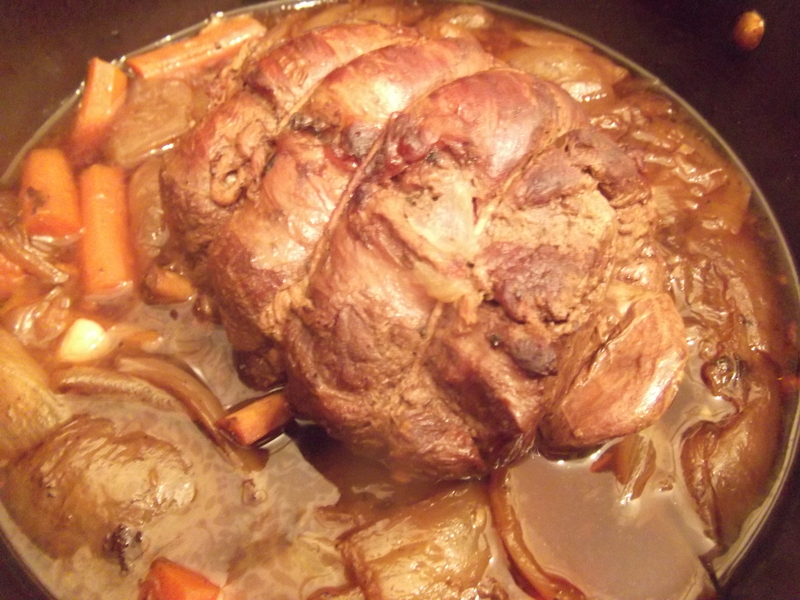 My grandmother made a good pot roast, though, so I knew that there was hope. She’d simmer hers in a small stock pot on the stove for hours, and the meat that emerged from the weird hodge-podge of ingredients she threw into the pot would emerge fragrant and tender. The texture was like pulled pork when you cut into it, and the meat was no trouble to chew or swallow. Her secret ingredient was coffee, and I remember thinking “oh, I’m not going to like that” when I saw her add it to the roast. But hours passed and the meat simmered and the flavours in the pot melded and turned themselves into something else, and when she spooned the gravy over the meat at the dinner table, I marveled at how rich and delicious it was, and how I couldn’t even taste the coffee. But I could taste that something was distinct, and if I hadn’t seen her put the ingredients into the pot I’d never have guessed at what it was. My version is a little different, but the ingredients are similar. It’s laziness more than anything that makes mine different – throwing something in the oven for hours and hours just feels like less work than monitoring something on the stove top. There’s not a lot to this recipe, and it can be assembled in minutes; it just cooks for about four hours, which is the perfect amount of time for whiling away a rainy afternoon. And if there’s still cold wind and snow where you are, this will warm your home right through. For cooking, it will be ideal if you have a pot that can transition from stove to oven. If you don’t, that’s okay. Just make sure the vessel you cook your beef in has a lid and is deep enough that the cooking liquid comes halfway up the sides of the meat. 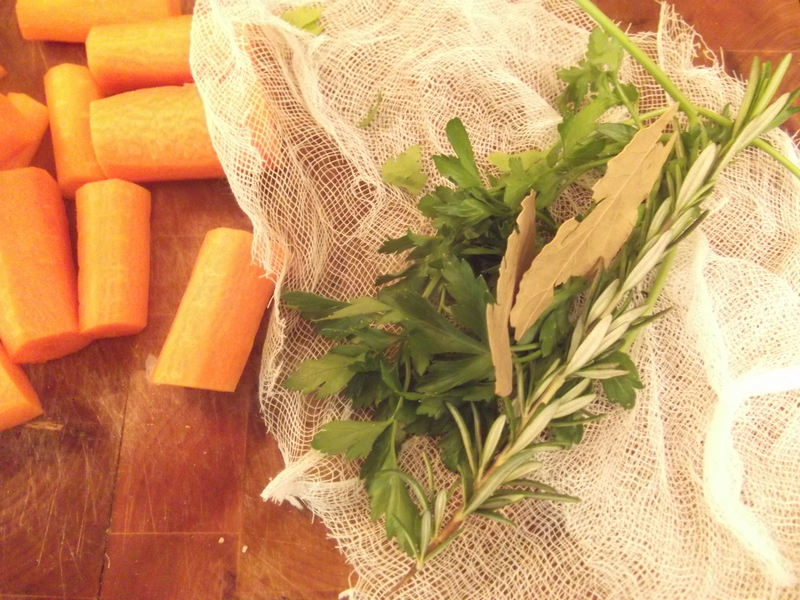 One last thing – I mention that you should bundle your herbs in cheesecloth and tie them into a bundle – a bouquet garni! – but if you don’t have cheesecloth or string, just throw the herbs in whole and individually and then fish them out at the end. Also, I know I’ve shown rosemary in the photo above, but it’s really better if you use fresh thyme. Rosemary, when cooked for a very long time, tends to impart a bitter flavour that I am not fond of. Thyme stalks are not woody, and do not impart that same bitterness. Generously season your beef with salt and pepper. Set aside. Using a piece of cheesecloth, bundle your parsley, thyme, and bay leaves. Roll tightly, then tie with string to secure. Set aside. Heat fat in your large pot over medium-high heat. 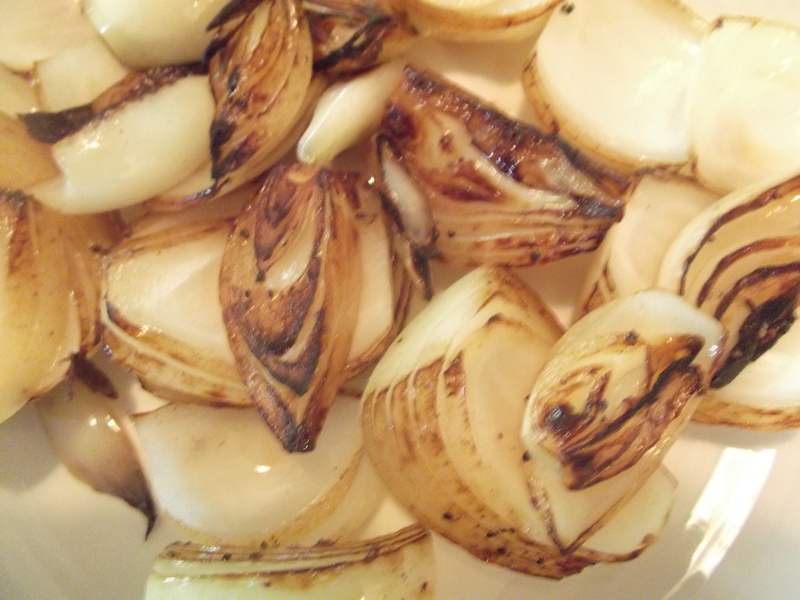 Brown your onions on each side, then remove to a plate. Add your beef to the pot, and sear each side of the meat. You want to achieve a deep brown on all sides of the meat. Remove the meat to a plate and set aside. Add the garlic to the pot, and cook for about one minute, stirring frequently. Add the cola to deglaze – make sure to scrape the browned bits off the bottom of the pot using a wooden spoon. Add the Worcestershire sauce and coffee granules. Add onions back to the pot, spreading so that they cover the whole bottom. Add the meat back to the pot, placing it on top of the onions. 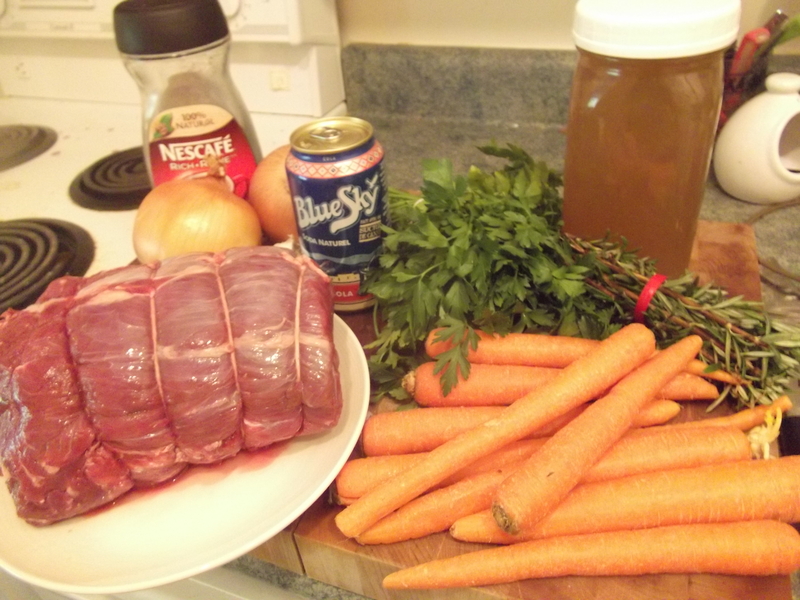 Add the herb bundle, then the carrots, and pour enough stock to come halfway up the meat. Give it a quick taste – is it delicious? Yay! Is it not salty enough? Add more salt. Cover and cook for 4 hours. 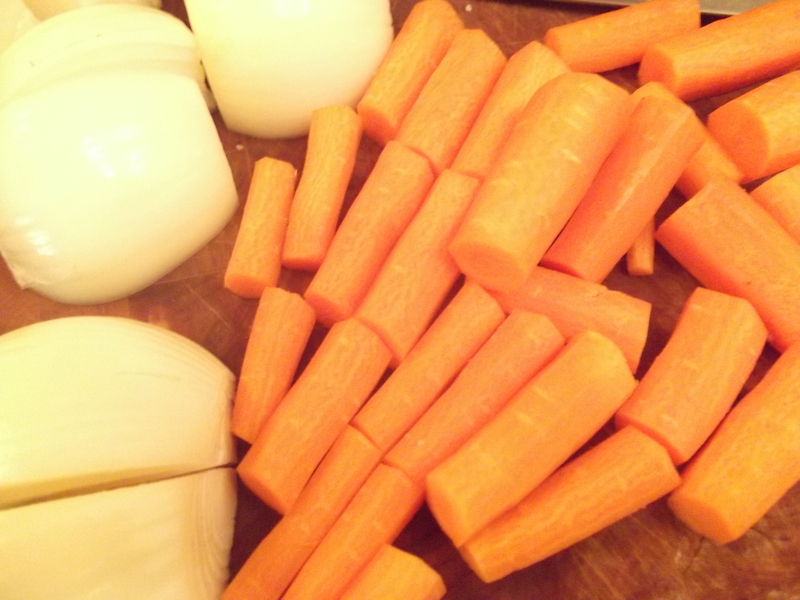 Serve with noodles – we had knopfle – or mashed potatoes. < Previous Roasted cauliflower soup. Next > It’s not so dark. Coffee, eh…never heard of that but heavens I make red-eye gravy all the time so WHY NOT! Also YES to the thyme! Love that stuff! and there happens to be a nice clump of it growing next to the rosemary. Thanks for this, I’m going to give it a try. Mmm. Sounds really good. We happen to have a pork tenderloin in the fridge so we’ll be making that tonight, but roast with a little horseradish is one of my favourites. Rootie – I have never had red-eye gravy! I need to look into this. Is it a southern thing? 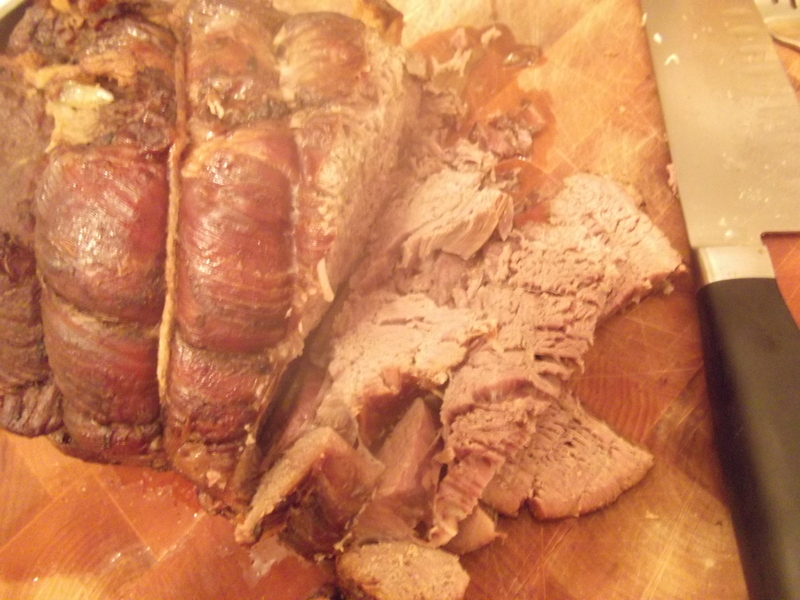 Ultimatedivorceparty – YES, I love a little horseradish on red meat. Tasted great and the meat was nice and soft. Thanks for the recipe. Now I have to think about what to do with the leftovers.